There is something going on for kids of all ages every single Sunday. At GateWay we believe our infants, preschoolers, and elementary children can learn the truths that guide them for a lifetime, all in a safe and loving environment. Our kids are cared for with the utmost priority put on their safety. Our trained staff are compassionate, have a great standing relationship with GateWay and have been background checked and cleared. In fact, most of our children's ministry volunteers are parents themselves! We want all of our parents to be involved in their child's experience. 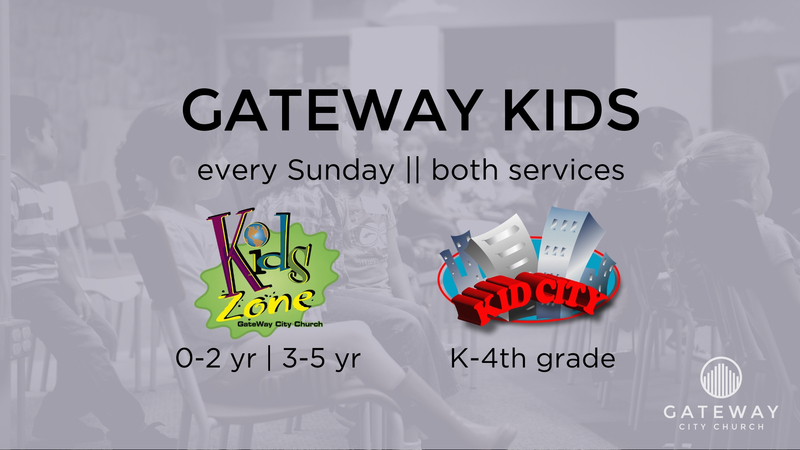 Once GateWay becomes your home church, we ask that parents make a light commitment to jump in on the class rotation, and help out in your child's class. Many hands make light work for everyone, and here at GateWay we have a lot of wonderful families with great kids. We need everyone's help to ensure these kids have a life-giving environment to grow in faith and have fun. We want every parent to enjoy services knowing that the classrooms are fully staffed. If you have any questions, concerns or have a positive feedback to share, please do not hesitate to call or email us. We want to hear from you! We have an exceptional Children's Ministry Staff and they are here to help. We are always looking for helpers who love working with kids. We do need your help and we are happy to answer any questions you may have. You can sign up online or email our Children's Ministry Administrator for more information.